Developed by the very best in the conversion utility biz, PDF Combine Pro lets you combine DOC files based on their folders; converting them into PDFs. Imagine that you have ten different folders, each full of DOC files. Normally you would need to go through each folder; each file; one at a time slowly converting each one from DOC to PDF. Not anymore! 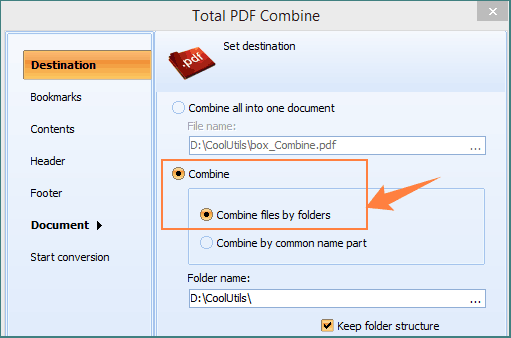 With the help of PDF Combine Pro, you can take those ten folders and create ten new PDFs (each corresponding with one of the original folders). While other apps might include similar technology, none are able to match the ease and speed at which PDF Combine Pro will help you get the job done. Further, PDF Combine Pro comes equipped with dozens of customization options that allow you to define the look and feel of your target PDFs. Because of the variety of options available, it's safe to say that your new files will end up even better than the originals. The easy to use GUI will help you every step of the way. All you need to do is select which folders you want to convert, click the Combine to PDF button. Specify your Destination options. 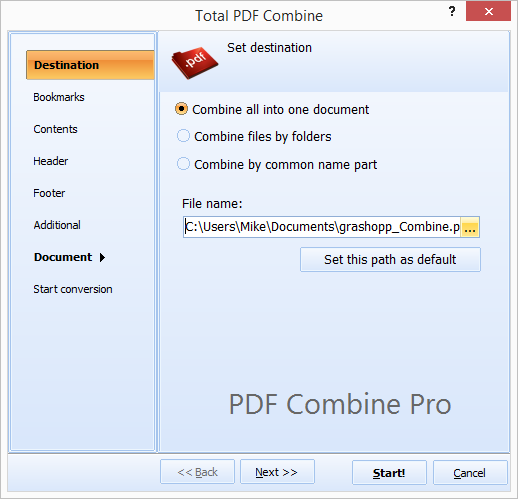 PDF Combine Pro will do the rest, allowing quiet conversions to occur at blazing speeds. For even greater levels of uninterrupted automation, advanced users are welcome to work by using command line parameters. Whatever your level of computer expertise may be, PDF Combine Pro makes your computing life so much simpler! Get started today by downloading your free trial version. Put the PDF Combine Pro through its paces. Experiment, play, design and see what a cool tool our converter can be. If you like what you see, you can upgrade to the full version at anytime. You'll receive a lifetime license, free updates for the first year, and access to our stellar support team. Still have questions? Feel free to ask! Combine folders with Doc files into multi-page PDFs - in one go!